Fans of quick card battlers will love everything about Mu77 Studio’s Card Monsters. Despite being fast-paced, the game has strategic depth. A player can take advantage of the “sacrifice” system, select the right equipment cards to deal double-damage and pick high-attack/defense cards that require fewer crystals to deploy. Yes there is some luck involved in this game as the cards are randomly drawn from your battle deck, but building a strong deck will make it easy to defeat opponents.The game provides plenty of ways to get cards for free, so there won’t be any difficulty in building powerful decks. You can read our quick tips and strategies if you want to win blitz duels and build a robust deck. You can use an equipment card on a monster card from the same faction. Basically, both monster and equipment cards should belong to the same color and only then you can combine them to make your main card stronger. However, white cards can be used on any card. There are various types of equipment cards – some provide armor that blocks damage from enemies, whereas others increase damage. You can use an equipment card that belongs to the same faction, but has a different weapon type. This is one sure-shot way to inflict a double blow to your opponent’s card. For example: You can use the “Fighting Gloves” equipment card on a Bloglodyte, since both belong to the same faction. Along with dealing magic attack, your monster card will also deal a melee attack, all thanks to the equipment card merged with it. Equipment and monster cards are drawn randomly from your battle deck. 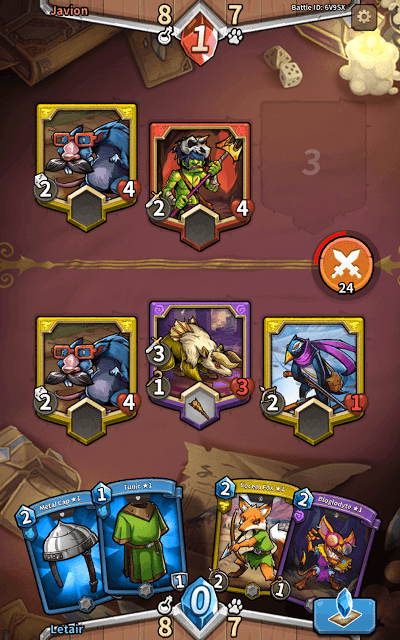 Everything’s alright as long as the right cards are drawn from your deck, but your opponent will have an edge in battle if unwanted cards appear at the bottom of the screen. In such circumstances, “sacrifice” comes pretty handy as it helps you replace an unwanted card with a new card from your deck. You can sacrifice only one card in every turn. Bear in mind that a sacrificed card can’t be used on the same battle again, so try to employ this strategy on equipment cards because new cards won’t appear until you use them on monster cards from the same faction. Cards require a certain number of crystals and only then they can be deployed on the battlefield. Some cards require fewer crystals, whereas other cards require more crystals. Try to add high-damage/high-health cards to your deck. Monster cards such as “King Rat” (3 crystals), Mushrhum (Requires only 2 crystals. 2 attack points and 4 health points), Tux Shooter (2 crystals), Wolf Rider (2 crystals. 5 Health, 2 Attack), Big Boned, Electric etc. are examples of cards that require 2 or 3 crystals for deployment, but can inflict more damage/have higher health stats. By leveling up: Win matches to level up faster. You may get a card pack on reaching a new level. The Crystal Ball: Go to “Ariann the Fortune Teller” and tap the crystal ball. You might get a card pack, although getting coins or crafting materials are also possible. Using Coins to Buy a Set of Packs from the College Store: Earn coins from winning training missions and PvP matches. You can also get them from daily rewards, crystal balls and quests. Save coins for buying a set of 10 classic card packs. You will need to earn 2480 coins to purchase one. Card packs can be bought from the shop. Tap the “Quest” button to access a list of tasks. Try to complete them before the quests section refreshes and a new set of quests appear on the screen. Completing quests will earn you cool rewards like coins, card crafting materials and card packs. Training camp missions played against AI opponents are pretty easy to complete. You will be drawing few cards and with little effort you can win card monster battles easily. The best part of playing these simple missions is that you will get plenty of coins and a card pack as “first clear bonus”. Make sure you win the battle in your first attempt to get rewards.